Demands on access networks continue to accelerate, and technology advances change and evolves at light speed to cope with this growth. To build a platform with more than 10-years reach requires a networking innovator with extraordinary vision, proven bench strength and experience, and of course, exceptional technology to keep pace. With over 1,000 global customers deploying DZS’s world-class solutions for their service provider and enterprise networks, in some of the harshest and most demanding environments in the industry in its pedigree, DZS’s MXK-F ultra high-capacity fiber-optimized aggregation platform is the latest cost-effective addition to its world-renowned MXK portfolio. The MXK-F chassis architecture is designed around a dual star design with redundant ultra high-speed links to each subscriber line card slot for future-proof support of today’s and tomorrow’s bandwidth-hungry fiber-based subscriber services. Also MXK-F management control and aggregation switch fabric functions reside on two separate cards, each of which can be equipped in a redundant configuration; MCs (Management Cards) and FC (Fabric Cards). Lastly, a fully-distributed database and parallel firmware loading enable simple fast upgrades. With a solid, wide foundation to build upon, MXK-F is well-suited as high-density fiber-based service platform to cost-effectively deliver ITU-T G.984 GPON, IEEE 802.3-2008 1 and 10Gb/s Active Ethernet, ITU-T G.987 XGPON1, ITU-T G.989 NGPON2, and other advanced fiber-based services for residential triple play and high-bandwidth business services over any FTTx architecture. MXK-F1421 is designed to be fully-compliant to meet the ETSI EN 300 standard for indoor cabinets and contains 16-access multi-service subscriber slots, and 2-network facing slots. MXK-F1421 can be mounted directly into a 21″ wide rack, and into a 23″ rack with adapter brackets. The chassis is equipped with a cable management tray, easy fan access, and rear-powered redundant power feeds. MXK-F1419 is also designed to be fully-compliant to meet the ETSI EN 300 standard for indoor cabinets and contains 14-access multi-service subscriber slots, and 2-network facing slots. MXK-F1419 can be mounted directly into a 19″ wide rack. The chassis is equipped with a cable management tray, easy fan access, and rear-powered redundant power feeds. Rounding out the MXK-F product line is the MXK-F219. With its MXK-F14xx lineage, it has exactly the same high-capacity backplane and high-speed virtues found in its larger siblings – except on a 2U 19″ form factor. A favorite in enterprise, hospitality, and academic applications, MXK-F219 contains 2-access multi-service subscriber slots, 2-network facing slots, and supports the exact same line cards as the MXK-F14xx. That means whether being deployed by an enterprise IT director, or by a service provider servicing a niche market, MXK-219, like all members of the MXK-F family, provides plenty of future-proof capability for 1G to 40G Active Ethernet, as well as GPON, XGPON1, XGSPON, and NGPON2 service requirements, and future undefined services. As the aggregation point for all MXK-F14xx platforms, MXK-F Fabric Cards provide a wide variety of network facing uplink options. These cards provide the network interface for cloud-bound link aggregation, link redundancy, and EAPS ring solutions. At the heart of this highly-capable platform is the MXK-F Management Card. With countless years of proven field experience, the management architecture of the MXK-F represents DZS’s latest state-of-the-art design, further raising the bar set high by other DZS MXK-family solutions. 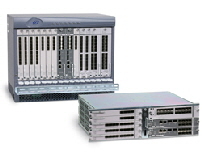 With a fully distributed database, both boot and upgrade times are exceedingly low to reduce enterprise and service provider OPEX, and since the forwarding plane control does not reside on the MXK-F Management Card, reboots and upgrade events are much simpler ensuring an optimal level of both reliability and availability – particularly when optionally equipped with redundant MXK-F Management Cards. Also, in addition to its management duties and user interface support ports, MXK-F Management Cards provide synchronization connection points for Synchronous Ethernet, 1588v2, and E1/T1/BITS timing inputs. The MXK-F platform supports a 16-port GPON OLT access service card providing standards-based support of 2.5Gbps downstream and 1.25 Gbps upstream bandwidth. The largest MXK-F1421 chassis supports up to 256 OLT ports, and with 128-splits and the use of Class C+ optics, the platform can support up to 32,768 ONTs. As with all products within the MXK portfolio, MXK-F utilizes DZS’s proven SLMS access operating system, providing intelligent, common functionality across all the company’s hardware products. Driven by more than a decade of experience in commercial operation and collaboration with more than 1000 service providers and enterprise customers worldwide, DZS SLMS software delivers functionality critical to today’s access networks in advanced networking, quality of experience, security, and management. To maintain tight security in the last mile, the MXK-F platform mounts considerable defenses, powered by all of DZS’s SLMS security features, including multicast control lists, secure bridging, broadcast storm detection and suppression, dynamic IP filtering, SSH and SFTP, and RADIUS authentication. Unlike vendors who have dodged the complexity of the ITU’s G984.4 standard for GPON ONT management, DZS provides a simple and clean interface to a fully standards-compliant OMCI implementation. DZS’s Smart OMCI approach allows the MXK-F OLT to interoperate with any vendor’s ONT, yielding rapid ONT and service extension without OLT software upgrades. Smart OMCI allows the user to configure flows, obtain stats, and support alarms on virtually any ONT. While DZS offers a full line of outside cabinets engineered specifically to support MXK-F platforms with a wide range of powering, and fiber termination options, all DZS MXK-F chassis are ETSI indoor cabinet compliant. This means that any MXK-F can be mounted within a 300mm deep cabinet, or two of them can be mounted back-to-back in a 600mm deep cabinet. This provides service providers and enterprise customers alike plenty of packaging options where available footprint is always at a premium.